The Elephant Bird was the heaviest bird ever to have lived. It was ratite, a flightless bird. Therefore their breast bone had no keel. It related to ostriches and emus. The Elephant Birds looked like ostriches. They have small head, very small wings, long powerful legs, sharp claws and long powerful neck. Its body was covered with hairlike feathers, like those of the emu, and its beak looks like a flat spearhead. 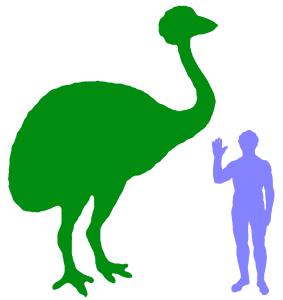 Although the Giant Moa was slightly taller than the Elephant Bird, it was lighter, so the Elephant Bird is the all-time heavyweight champion among birds. It was over 3 metres (10 feet) tall! The elephant birds stood taller than a basketball hoop! It weighed close to 400 kilogram (880lb). Their eggs have a circumference of over 1 metre (3 feet) and a length up to 34 centimetres (13 inches). The egg volume was about 160 times greater than a chicken egg. Believe it or not, you could actually make more than 50 omelettes from one of its eggs! They were herbivore. They existed only on the island of Madagascar for 60 million years. They lived well in Madagascar until about 2000 years ago, when humans landed on the island. Sad to say, only 1000 years later, they were extinct. People hunted them for their meat and their eggs were stolen from their nests for food. Such a gigantic eggs can only be laid in small number ant these birds probably bred slowly. So, after a while, they were extinct from the face of the earth due to hunting and habitat destruction too.